Today it is the 21st of July – Belgium’s National day. 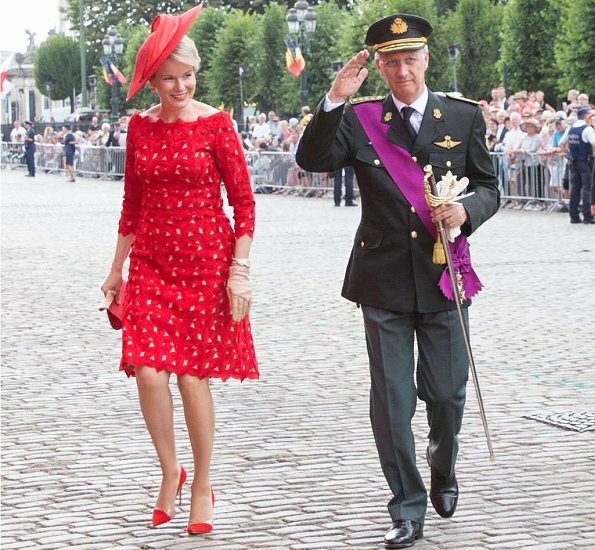 The Belgian Royal Family will be attending several celebrations throughout the day. 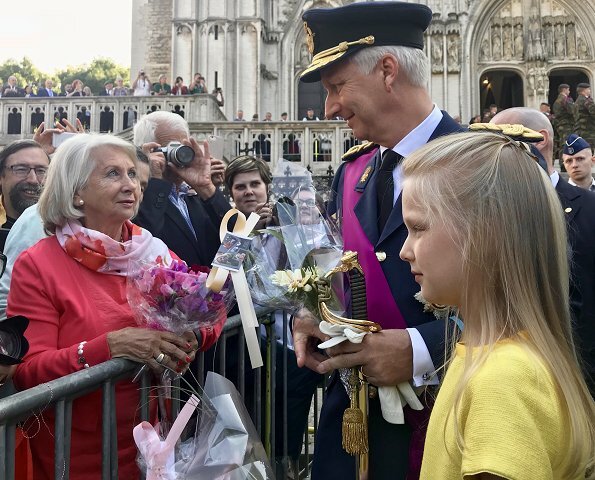 On July 21, 2018, King Philippe, Queen Mathilde and their four children Crown Princess Elisabeth, Prince Gabriel, Prince Emmanuel and Princess Eleonore of Belgium attended the Te Deum mass held at the Cathedral of St. Michael and St. Gudula. This national holiday is celebrated annually on 21 July. Independence Day celebrates the separation of Belgium from the Netherlands in 1831, as well as the formal establishment of the Kingdom. 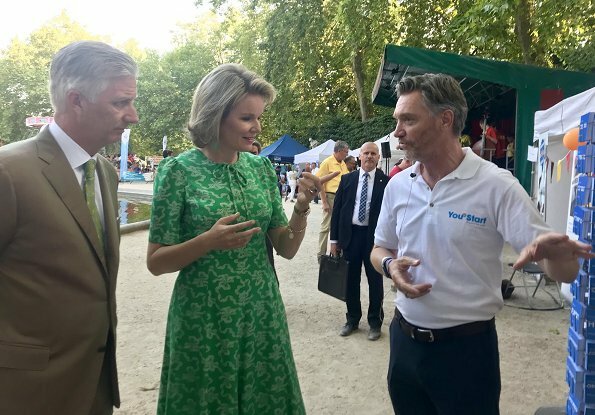 King Philippe and Queen Mathilde of Belgium attended the 'Fete au parc - Feest in het Park' celebrations on the Belgian National Day 2018 in the Parc de Bruxelles - Warandepark. The Queen wore a new green silk dress by LK Bennett. Pretty detailing on Mathilde's dress. Like her hair and hat. Elisabeth looks so pretty in her dress and cute heels. Maxima in "Mathilde-Look" and vice-versa, shure. Mathilde and Maxima are tall Ladies and they both have 3 children and a husband. 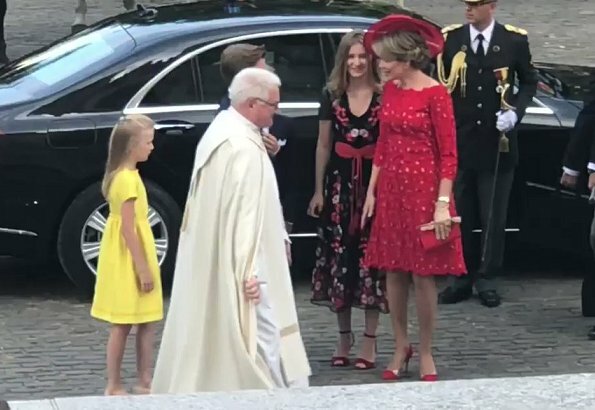 I love Mathilde's dress - bright red looks fantastic on her. Not so keen on the hat - the angle looks wrong for the style of hat. Elisabeth looks wonderful - her outfit complements her mother's. The dress is really pretty and she looks really grown up without looking like she is playing dress up. 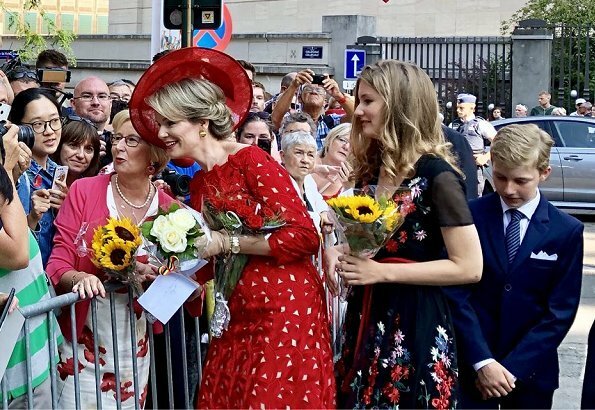 Today's Belgium National Day the family looks great. Mathilde's and Elisabeth's dresses are in a class of their own. 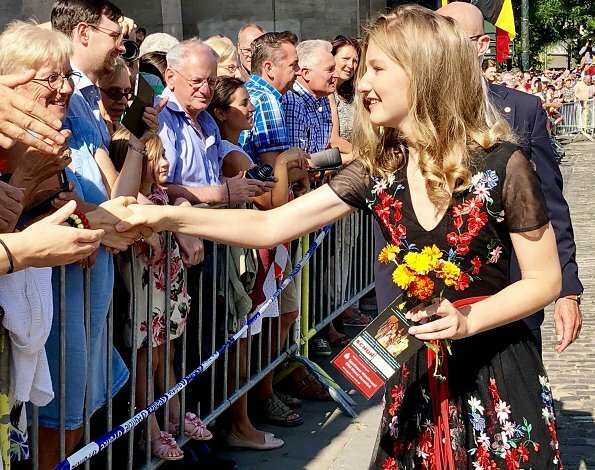 This young Family must be Belgium's Pride.As it should be. Happy National Day. Mathilde looks so regal! I thought that the fabric of her dress was a little busy, but on a second glance it works with the simplicity of the cut. The hat is fantastic if you are into headgear😄 Elizabeth's outfit is fresh an vibrant, with a little romantic vibe so appropriate at her age. Both women look fantastic. Mathilde in red, Elisabeth in black, Eleonore in yellow. So all 3 national colours are represented, a really nice idea. And they all look great. Agree, all of them are looking lovely. 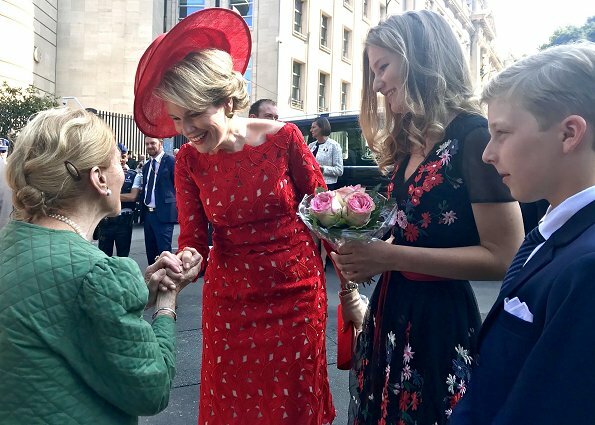 It´s cute that the three ladies of the family are dressed in the national colours. 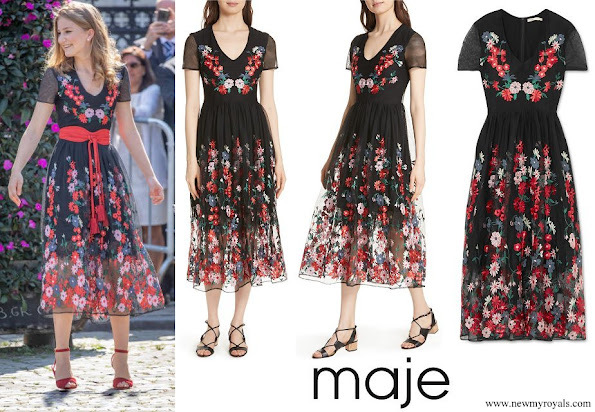 Wow, I love Mathildes dress, fantastic! Coincido con "Romana... "las tres llevan el color Nacional;(fino detalle) MATILDE Y ELIZABETH ELEGANTISIMAS festejando 5 años de reinado! 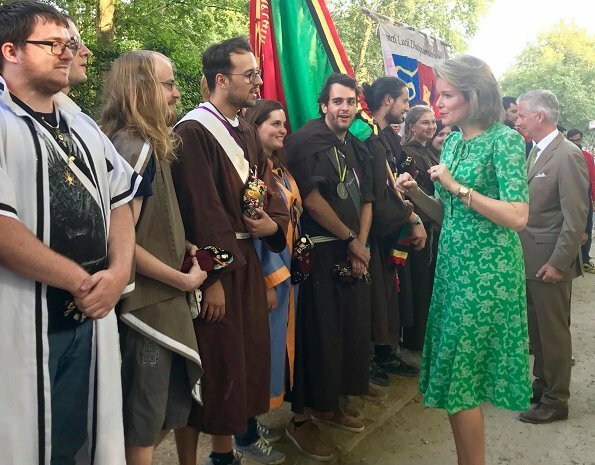 de prinsessen zien er prachtig uit ,een leuk gezin !!!! Magnifique famille! J'aime bien la tenue de Mathilde mais Elizabeth est wow! Très jolie sa robe, sa coiffure, ses chaussures... Un sans faute! Pss Elisabeth is a beautiful young Lady, so are her younger siblings.The King and his family are a class act, always prim and proper. Together they stand today at the National Day. Beautiful dresses and great Family. God bless them and Belgium. En la foto 2 y 3 es Máxima!! Creí por un momento que era Máxima y no Matilde. El vestido perfecto y divino, Elizabeth está muy elegante y acorde, esa niña ya tiene buen gusto y sobriedad para vestir! 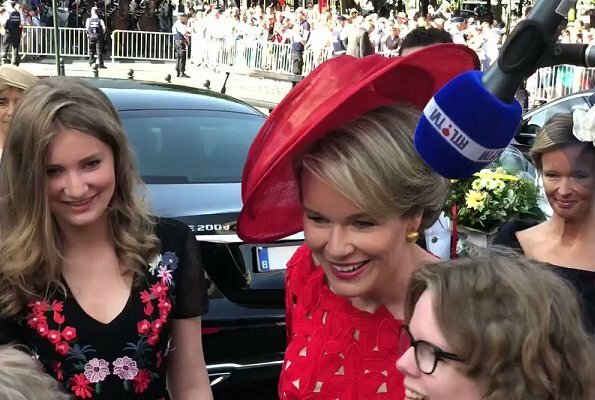 Queen Mathilde wears the green dress and the pretty-women-dress very well, both are flattering. Mathilde's rode outfit is prachtig maar ik zou die hoed niet graag hele dag op mijn hoofd hebben. Het groene jurkje is ook zo mooi, maar als je zo een slanke lijn hebt als Mathilde past alles mooi. Elisabeth op hoge hakken op die kassei, ze zou even mooi geweest zijn een een mooie sandaal, maar meisjes van de leeftijd willen hoge hakken. 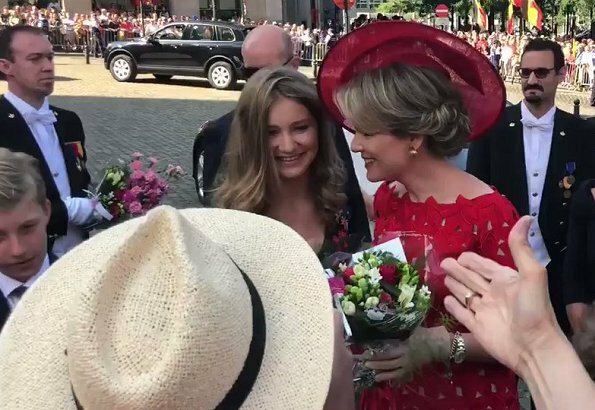 Oh my godness, no words to describe how amazing princess Elisabeth is. That wonderful dress she wars, she has a real sense of fashion in this young age. I think she'll have a lot of nice looking surprises for us in the next years on her way to became an adult Person. Mathilde se caso en Diciembre 1999, ella sigue siendo fiel a su estilo, a Edouard Vermeulen, couturier de la marca Natan, su ropa la lleva con elegancia, es discreta, no la gusta llamar la atencion. Forman una bonita familia, los hijos muy bien educados, Elisabeth tambien tiene su estilo, es muy linda,poquisimo maquillaje, no posa como una star. Me gusta su sencillez y naturalidad. The green dress is lovely - pretty and summery. I couldn't find pics of the royal family at last night's fireworks. Perhaps someone else is/was more successful? Thanks in advance. 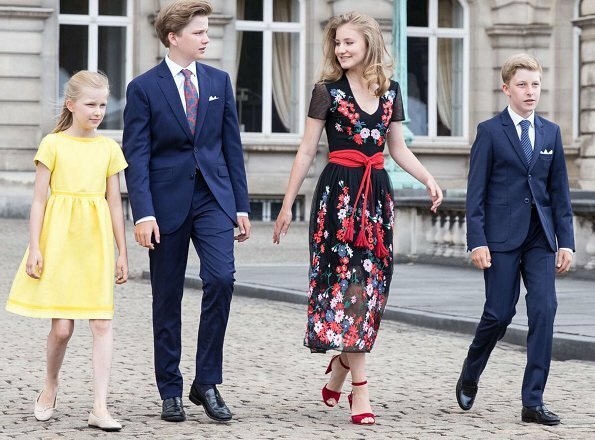 Princess Elisabeth is turning into a confident young woman with a sense of fashion. She looks lovely and I love her shoes. The Queen has another fashion hit with this lovely red dress and matching hat. Red is a good color for her. The boys look handsome and their younger sister looks bright and sunny. In the second and third photo, the queen can easily be mistaken for Máxima! 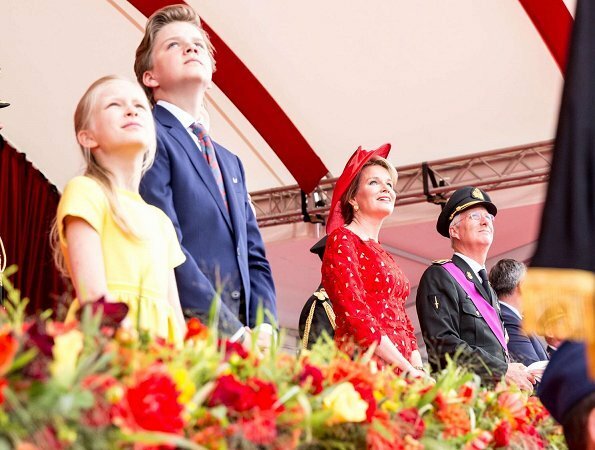 Very nice pictures of the Belgian Royal family. The queen doesn't remind me at all of Maxima. Mathilde a lot more subdued and elegant. I do agree her red hat is not a good choice, it looks like a plastic picnic plate sideways, bad choice. She looks good in green. 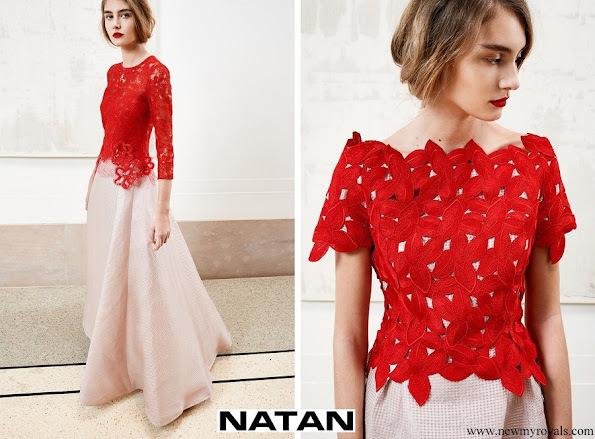 Nat an is a Belgian designer, based in Brussels and has been working for the Belgian royal family for a long time. Maxima is copying this as she often wears Natan also.